The much-awaited results of the Karnataka elections are to be announced today, with the trends tilting heavily towards the BJP, and the whole country has shifted its focus to the southern state. The state election commission has been working tirelessly for the conduct of fair elections in the state. But certain individuals and even some media outlets, create fresh problems due to their propensity for sensationalisation and in the process, create panic and doubt because of their fake news. 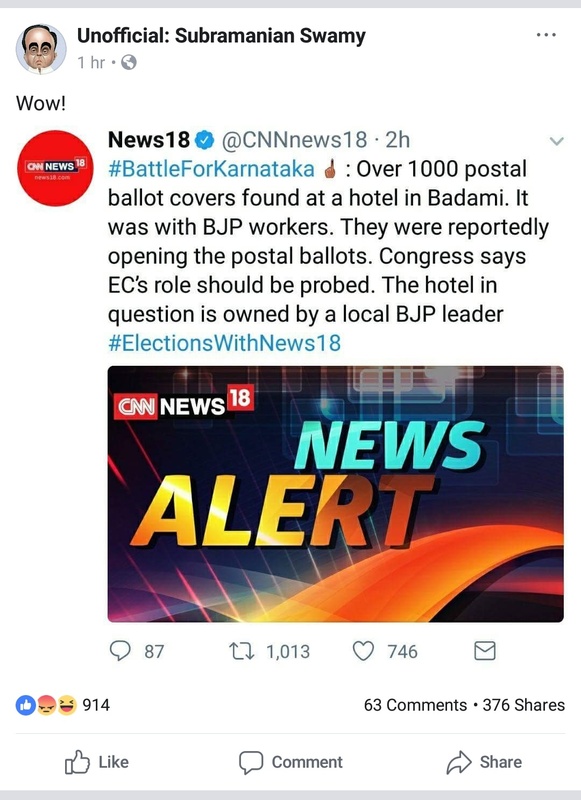 Yesterday CNN News 18 reported that over 1000 postal ballot covers were found in a hotel in Badami in the possession of BJP workers. They even added that the BJP workers were opening the covers and the said hotel where they were found belongs to a BJP leader. They even went a step ahead and added that Congress has demanded that the Election Commission’s role should be probed. Even co-founder of self-proclaimed fact check website endorsed this fake news. However, the fake news was soon called out by Times of India’s Bharti Jain. 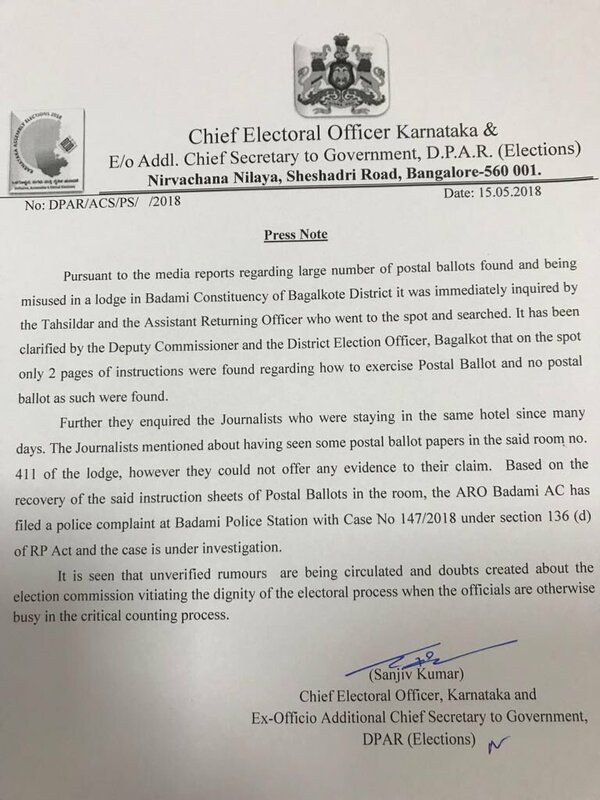 After the misleading news report over the postal ballots, the state election commission ordered a probe over the matter and the Tehsildar and Returning Officer for the concerned constituency were sent to the hotel. But upon inquiry, they reportedly found that the ‘1000 postal ballot covers’ were in fact 2 sheets of paper with instructions on how to exercise postal ballots. The press note released by the office of the Chief Electoral Officer also added that the journalists, who were staying at the same hotel since many days, failed to provide any evidence to support their claims. The press note also added that unverified rumours are being circulated and doubts are being created about the election commission vitiating the dignity of the electoral process. The note added that their staff are busy in organising the counting process, subtly implying that such unsubstantiated rumours only end up wasting precious time and energy of a dedicated staff. CNN News 18 promptly deleted the tweet where they had made the claim. It is notable here that bribery, distribution of goods and gold have all been reported in Karnataka during the run-up to the elections. Recently a Congress leader was found with 10,000 voter IDs in a flat in Rajarajeshwari Nagar and gold jewellery meant for distribution among voters were found from a Congress leader’s house in Arkalgod constituency.